Just over 500,000 end-users are now within reach of Chorus Ultra-Fast Broadband (UFB) following the build completion of 373,000 premises across New Zealand. According to Chorus Q1 connections update - released to the NZX - for the three months ending 30 September 2015, fixed line connections decreased as expected, as dual copper-fibre lines were removed and fibre uptake continued to grow in non-Chorus ultra-fast broadband (UFB) areas. Consequently, total fixed line connections decreased by 18,000 lines to 1,776,000 while broadband connections increased by 11,000 lines to 1,218,000. 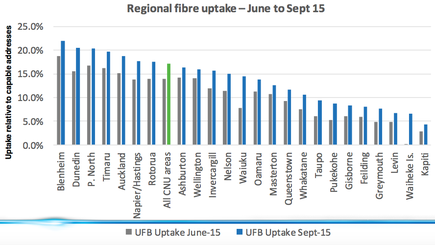 The report claims fibre uptake increased from 14 percent to 17 percent across Chorus’ UFB areas and 39 percent of mass market fibre connections are now on plans of 100Mbps or better. New fibre connections are averaging more than 300 a day with 6,000 fibre connections added in September, the largest monthly increase since the rollout began. Chorus completed UFB build work in two more areas - Greymouth and Masterton - meaning there are 501,000 end-users within reach of Chorus fibre. About 102,000 rural lines are now within reach of better broadband through Chorus’ Rural Broadband Initiative investment and just 1,900 lines remain to be upgraded. Meanwhile, in reference to market trends, service provider competition continued to intensify with 2degrees entering the fixed line market in July following its acquisition of Snap. As reported by Computerworld New Zealand, Vocus and M2 (which acquired Callplus in June) have also announced a proposal to merge in early 2016. Read more ​Is it time for Govt clarity around software patents and TPP? Total connections decreased by 18,000 lines with the decrease driven by removal of dual copper-fibre lines and fibre uptake in non-Chorus fibre areas. 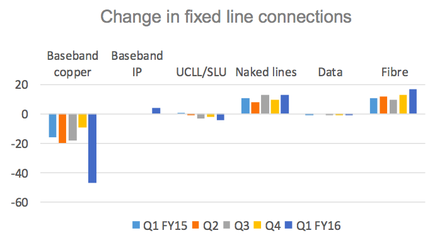 On the flip side, there was a 19 percent increase in fibre lines and 8 percent growth in ‘Naked’ lines with baseband IP connections growing as RSPs seek lower cost voice inputs. 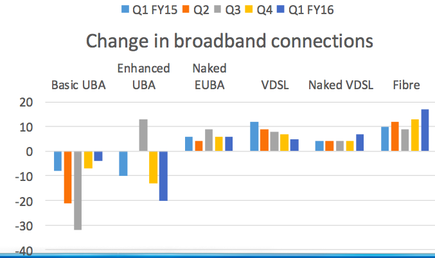 In addition, UCLL lines decreased as the UFB footprint grows. Chorus reports an increase of 11,000 broadband connections or 1 percent for the quarter with copper broadband connections declining as end-users migrate to fibre with 18 percent of connections now high-speed VDSL or fibre. There was 17 percent uptake across Chorus UFB areas, with 86,000 connections within UFB deployed footprint (68,000 at 30 June). At present, 39 percent of mass market connections now on 100Mbps plans or better - Blenheim has highest uptake at 22 percent relative to capable addresses. As mentioned earlier, the UFB rollout is now 45 percent complete with 501,000 end-users now within reach of Chorus UFB with the build complete for 373,000 premises.